It is from the Church of God Worldwide Ministries web site but it's a 40 meg download there and that's a bit much. People kill people. And they will kill people with whatever is available. With a little training and practice you can kill someone with your bare hands. So if you ban guns a knife will do quite nicely. Ban knives and something else will take it's place. This is the same way doctors treat disease, get rid of the syptoms and leave the disease intact. How about preventing the disease in the first place. How about living within the laws of health for a sound body and living within the laws of the Bible for a sound mind. No, I guess we couldn't do that. I am separated from this particular neigbor by a wooded lot. They are forever burning some part of their yard. If they want to clear some brush from around a tree, they burn it. Weeds taking over a part of the yard? Burn'em. I'm surprised they don't just burn the lawn when it gets too long. Yesterday I was taking James out and when we walked out the front door we smelled smoke. It's not unusual to smell smoke here so we just walked to the car. I saw smoke coming from the direction of my neighbor (surprise!) but it seemed a little closer than normal. I walked over toward the smoke and into the woods. The fire was there, just on this side of his fence. The underbrush was on fire and it looked like it was very close to spreading to some trees just above. I've got my cell phone in my hand ready to call the fire department and I'm looking, I don't see anybody else around. I don't want to call if he is tending the fire but ... where is he? I drove over to his house and knocked on the door. No answer. I walked around toward the fire and suddenly he appears, hose in hand. I told him I was getting worried about the fire because I didn't see anyone around. He had stepped into the house. So I left. When I got back it was out. OK, no problem. So, at 10:15 pm I get in my car to go to work and drive by his house. What do I see? A fire in the same spot! He was burning this late? I stopped and watched for a minute, didn't see him. Now what do I do? All their cars were there, he had to be there. He's a crazy, ole coot anyway. I just went to work. When I got back this morning all was well. Do other peoples neighbors do this? After Newsweek put the American flag in the trash on the cover of it's Japanese edition, Joseph Farah is rightfully ready to give up reading the magazine and urges others to do the same. I will never buy another issue of Newsweek - at least not while it is in the hands of the rogues currently running it. I will do my best to live without the newspaper published by its parent company, the Washington Post, as well - even though it is my local paper. I recommend to everyone reading this commentary today to follow my lead. In fact, I urge you to spread this column by e-mailing it to your friends across the country. Let's start a little viral brushfire the heat of which they will feel in the corporate suites of Newsweek. Don't write nasty letters to the editor. Don't try to persuade Newsweek to change. Just live without it. See how easy it is. When I first heard about this Newsweek cover I had the idea to never buy or read the magazine again as well, the only problem is I never bought the magazine before so not buying it, for me, doesn't accomplish much. Maybe someone who subscribes will read this and drop the subscription. If Newsweek thought an isolated, unceremonious and imaginary desecration of the Quran was newsworthy, what can we say about Newsweek's public, high-profile and real desecration of the American flag on its cover in a foreign edition? They are on the wrong side. "It's creeping into the U.S.," Dr. William Levis, head of the New York Hansen's Disease Clinic, told Columbia News Service. "This is a real phenomenon. It's a public health threat. New York is endemic now, and nobody's noticed." Read that whole article. I didn't think anyone ever got leprosy anymore. Yes, we went to Tchoup Chop last night and it was very nice. I went expecting to pay $6.00 for parking (I don't care for valet parking) but when I followed the signs to park, the gates were all open and you could just drive in. There was no one around to ask, so we just drove in and parked. Walking to the hotel we were passed by many cars speeding through the lot, apparently driven by valet parking. We saw one particular Jaguar 4 or 5 times. I guess it was a test drive. The hotel (Royal Pacific Resort) was very nice, and it looked crowded. You have to walk past the pool to get to Tchoup Chop and it was packed with people, too. We saw a couple of other restaurants there and they were actually more expensive than Emeril's - but didn't seem as nice inside. We arrived about 20 minutes early for our reservation and they seated us immediately. There is a large formal pond in the center full of ceramic (I think) lily pads and the water overflows the edges. It looks nice and James would have wanted to play in it if he was there. There are tables around it but we were led off to the right side. There are booths around the outside wall and we sat at a table for four next to them. I sat next to Irma, not across. It was a good sized table. There are no windows except at the front entrance but the walls were brightly tiled (blue) and lit so that I kept thinking the light was coming from outside. By that time it was dark outside. The ceiling glowed orange. I liked it but it was a little too dark for me. Not badly, but I like light, maybe it's my eyes. The restauant is noisy. There is some background music but the noise is mostly from everyone talking. It was so bad that you had to listen intently to the waiter to hear what he was saying. Sometimes I think I didn't hear him correctly. Irma would say something and I would say, "What! ", almost everytime. I had to lean into her to hear and talk. They gave us two menus but one was a lunch menu. It was a little hard for both of us to look at one menu, so I mentioned it to the waiter and he brought another dinner menu. He said someone would be fired for the oversight. There were three waiters for each table. Since I don't eat shellfish or pork, there was a lot on the menu I couldn't eat, starting with the shrimp toast they put on every table (Irma says I wasn't missing anything). They had a peanut dipping sauce for them and that was fabulous, I just wish I had something else to dip in it besides my little finger (to taste it). In fact I wish I had brought it home to put on some pasta - that would be good. They also gave us each a little vegetable tart and that was good, too. I could not eat any of the appetizers. They had some egg rolls but they had pork in them. That was disappointing. Irma liked the salad but couldn't finish it. One waiter told her she could keep it on the side while she ate the entree and another waiter promptly walked over to the table and took the plate away. We both laughed because what sense is it to have three waiters when they don't know what the others are doing. The original waiter brought the plate back after a few minutes - all with out us having said a word. We just thought it was funny. My salad was wonderful. I ate the whole thing. The chicken and the fried rice were outstanding. She didn't finish that either but I had a few bites of each. She took the rest home. I would order that again. My salmon was delicious. The wasabi mashed potatoes were good too, but I couldn't really taste the wasabi. Irma tried them and said they were good and that means there was no spicy heat to them. I ate all my food. I cleaned the plate. In Japan, when you clean your plate it is a signal to the host to give you more but I didn't get any more. Too bad, I would have eaten more. For desert Irma chose the Hawaiian Vintage Chocolate Chocolate Cake. Good choice for chocolate lovers. It was so good, made with a dark bitter chocolate - not too sweet at all. Just delicious. I had the Banana Cream Pie. It was unbelievable and Irma agreed. Wonderful. I was full but not stuffed. Very satisfied. Irma took the chicken and salad home. The bill was $88 plus tip. We didn't have wine or drinks. We were there 2 hours. On the way out we saw that Jaguar driving around again. It was the same kind and color anyway. I tried to go out the same way I came in but the gates were down and you needed a key card to get out. Oops. I drove to a different exit, same thing. Great. No one was around either. We watched a car go out and another followed behind but the gate closed on the hood and popped up, the driver kept going. It came back down about half way but too low to go under. Finally I noticed a gate with a guard shack and someone was there. He asked if I had a card and I told him no and explained what happened. I had no problem paying, I was expecting to anyway, but he said OK and let us out. And that was it. We were both very pleased with the restaurant and would go back again. Thank you Emeril. "Rick Warren begins his best selling book The Purpose Driven Life with a sentence worthy of our age: "It's not about you." Frankly, folks, I'm not worth that much, and I am certainly not worthy of being a co-heir with Christ. Neither am I worthy of being called a child of God, but that's exactly how the Book refers to us who accept God's gift of eternal life (Romans 8). If the Book means what it says, then as co-heirs we are to inherit everything that Jesus inherits, which is "all things" (Hebrews 2:10), including those stars I gaze at on those dark, crisp evenings. It is right to dream about galaxies far, far away, for God has put that desire in our hearts. Even though He has the right to be called the I AM, He desires not to horde power and position and control to Himself, but instead has created the universe to share. It could be all about Him, but the Great Center of the Universe has decreed otherwise. By doing so, He made it all about us, but that only works if we make it all about Him. That dilemma is the real meaning of love." Today is our (Irma & I, who else?) 7th wedding anniversary. We have a reservation at Tchoup Chop. I'll let you know how it is. I'm looking forward to it but I'm not too big on fancy restaurants. I worked last night at the hotel and then all day today on the roof. The tar paper is on and it's ready for shingles (one side, I still have to do the other side). When I got home I mowed the lawn. I have no clue why I am not completely exhausted. Last evening I couldn't sleep, I got maybe two hours. Maybe tonight I'll drop. Thank God for the Sabbath. I used to work seven days. No more of that, thank you. This is what I've been doing all week. After working all night I head over here and work until about 2 pm. 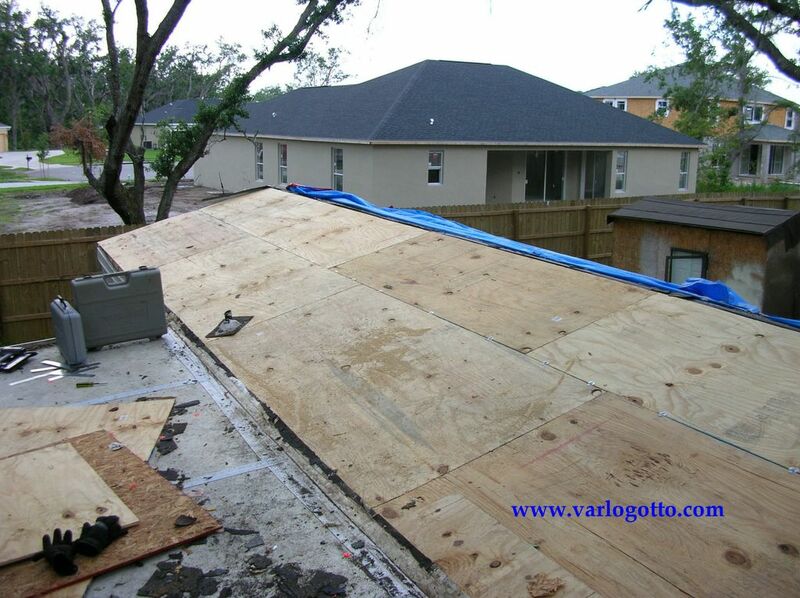 I've removed all the shingles and replaced most of the plywood sheathing. A few more to go and I can lay the tar paper. I'm waiting for a call from a friend to meet him so we can reroof his father's house. He called me last night and said he was in Lakeland with his girlfriend and a Harley. They were going to spend the night there, get up early and ride over here and call me. I told him I didn't think he would want to get up that early but he said yes, he would. I already started on the roof last week but I need his help with some things. I really want to get this thing done but part of me doesn't want him to call. I worked last night and I work again tonight. I do want to finish it though. The sooner the better. It's a beautiful day for it too. I'm going to mow the lawn while waiting, if I don't keep busy I'll fall asleep. Still waiting. Does Bush believe in free market? More from Joseph Farah on illegal immigration. He's hit the nail on the head with this, these are my thoughts exactly. "If there are no workers to perform jobs at a minimal pay level, the wages will increase to attract those workers. This is called the law of supply and demand. It's not a theory. It's not a hypothesis. It's not guesswork. It's a natural law. What would be wrong with paying higher wages for work considered unattractive to many Americans? There are lots of dirty, hard jobs to be performed in America. Those jobs will all be filled when employers make them financially attractive enough to American workers by paying competitive wages." Our leaders are taking this country over the edge of a cliff. The warning signs are all around us but by the time the American people as a whole wake up and see it, it will be too late. "It's amazing, isn't it?" Dr. David Schmeidler told the local paper. "I have never seen this happen in my career. I've read about it happening, the severely brain damaged recovering suddenly, but never seen it - until now." Why hadn't anybody ever read about it before Terry Shiavo was killed? Doctors and scientists don't really know what they are talking about much of the time, not completely. They know in part. What they know is subject to change at any time because there is so much they don't know. And they don't know just how much they don't know, they make assumpions based on their knowledge of the subject - complete or incomplete. They sure are good at acting like they know everything, though. Of course, some are more honest with themselves about this than others. How many people really don't understand this issue. "We have a right in this country - no, a duty - to screen out would-be immigrants to make sure they are law-abiding, disease-free, productive individuals who will be a benefit to American society, not a drain our limited resources." Only if you haven't been paying attention for the past 40 or 50 years. I, personally, have known this was coming and have been watching it develop since the 80's. There has been nothing quick about it - quiet, maybe. But evidence is mounting that the EU does not only aspire to be a counterweight to the United States in global affairs; it has already become one. With the largest market on Earth, it does much to regulate global commerce - even that which takes place beyond its borders. You really should read up on this, it is and will continue to effect your life. This is interesting. What government do you suppose it is? Few governments ever dared ignore her. The ones that did are now gone, and she remains. Some hate this government, and many today are indifferent towards it, but it alone has transcended the human history of the last two thousand years and remains. Only God knows how long it will endure, but I would expect that in some form it will be there on the day the world as we know it ends. This is what we did Sunday. My brother-in-law has this remote control car and it's a lot of fun, the kids love it. This one is fast, it can do about 30 mph. This is an excellent article, or transcript, by Ron Dart. I've been receiving at least one email a day with this virus. Do not open attachments unless you are sure what it is and where it came from. And don't click on a link in an email unless you know for a fact what it is and who sent it. Filed Under "You Got To Be Kidding Me!" First, we got spinning rims for our cars. You know, the wheels that keep spinning after you stop or stop spinning when you go. Next, we got the hubcap version. Yuck. But, what do you do if you don't have a car? Not to worry! They got you covered. May I present ... wait for it ... Spinning Teeth! Ta Da! How cool is that? The only problem is I think you have to surgically remove your lips so everyone can see them all the time. 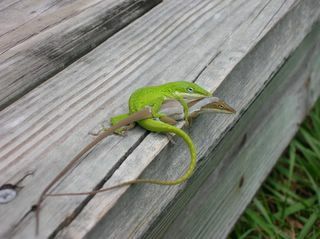 I don't know what's going on, but we sure have a lot of these lizards around the house. How Long Can They Keep Up The Charade? I mean it's a resaurant, right? They are supposed to bring you your food soon after you order it. So, if it doesn't exist, they can't bring it. Who pays for food they never got? I would never go back to that restaurant, though. I'm hungry, I want food, not games. I'm glad to see my anti-virus program is actually working. It checks my email as it is received. Viruses found in the attached files. The file account_info-text.zip: Virus identified I-Worm/Sober.P. The attachment was moved to the virus vault. I had heard there was a problem with the internet phones not being able to call 911 but this is the first time I've heard of someone actually needing to call 911 and not being able to. Tragic. I wonder what the problem is? I don't know how the internet phone companies work. I hate phones. Most are unresolved because policyholders haven't shown documentation that repairs have been completed, a problem which may have to do with contractors having more work than they can handle, state Insurance Commissioner Kevin McCarty told the Cabinet on Tuesday. Others are being held up because of disputes on whether damage was caused by flooding or wind, among other reasons, McCarty said. I see houses everyday that are going to have a serious problem when another hurricane comes along. He says there was a third man, the FBI had cleared the man. Either Terry Nichols is lying or the guy fooled the FBI. For obvious reasons I don't believe the FBI is too interested in getting to the truth. Maybe, but most times mistakes get covered up. It may go up in smoke and take your home with it. I highly recommend disconnecting the cable from the sensor on the front of the master cylinder. This article says it's an air conditioning sensor but I believe it is, in fact, a cruise control brake sensor. Yes, it is the cruise control. I would be making sure my Ford doesn't use the same type of switch as the recalled vehicles because Ford is apparently dragging it's feet on this. Call the Ford dealer and check part numbers. And don't park it in the garage. Ford refuses to offer assistance to victims of the fires and disclaims any knowledge of why so many fires have occurred under similar circumstances. Educate yourself on this issue if you own one of these. NHTSA is among the last to admit that the problem extends beyond the 2000 model year. Dimitri of Baltimore was relieved when he heard about the recall of the 2000 Expeditions, since his was a 1997. "Boy was I wrong," said Dimiti. His Expedition caught fire and burned a few nights later at the gym, destroying another SUV parked next to it. P.S. If you disconnect it, remember it is the brake sensor and if the cruise control still operates it will not shut off when you use the brakes. Don't use the cruise control. Congressman Tancredo is doing the right thing. The U.S. congressman leading the charge to crack down on illegal immigration is ridiculing the suggestion it's somehow racist to want better border security. Absolutely correct. Our educational system and politically correct society has produced a multitude who cannot logically think through a problem and come to a truthful conclusion.